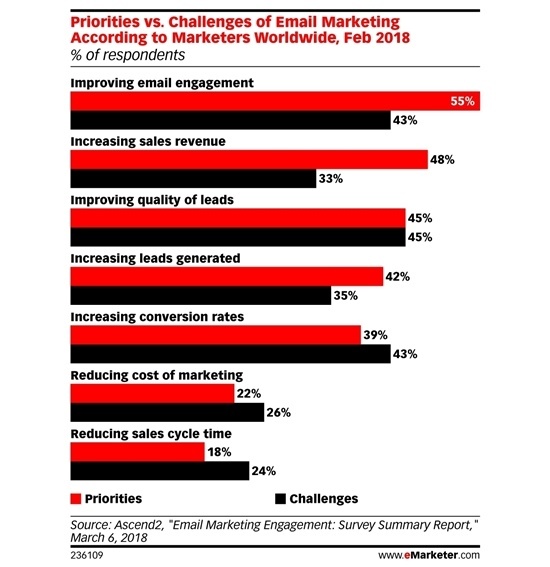 Increasing email engagement is marketers’ top priority and challenge, according to research (see chart, below). Many marketers believe the path to better email engagement is paved with witty subject lines and colorful design. However, no amount of clever wordsmithing or quick fixes to appearance will mend that fundamental block to engagement: poor deliverability. Marketers have a lot on their plate, and email certainly isn’t the only tool in their toolbox, so it makes sense they would lean on some assumptions about email best-practices. The problem is that many of those assumptions are myths, and they can have a serious impact on an email campaign’s success in a variety of ways—from simply poor deliverability to more serious problems, such as blacklisting. So here’s a list of five of the most dubious myths marketers need to unsubscribe from to increase email deliverability and obtain better email results.